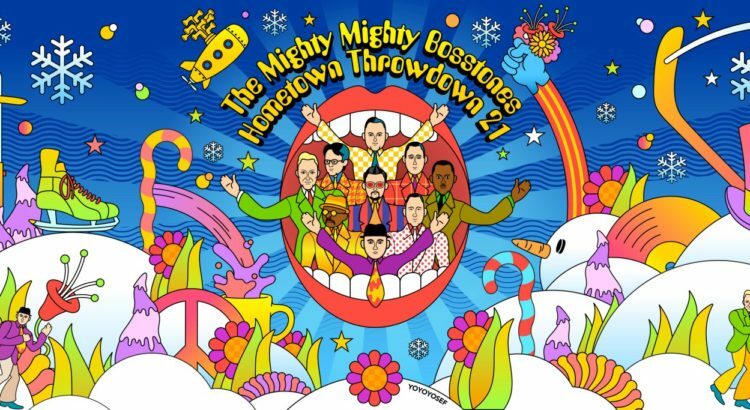 It’s that time of year again, folks; The Mighty Mighty BossToneS have announced the dates for the 21st annual Hometown Throwdown at the House of Blues. This year’s shows will take place the weekend of December 28th-30th, and tickets go on sale this Friday, October 5th. Interestingly, this year’s final Sunday show will be a matinee, which I’m sure will come as good news to those of us with “day jobs” or “other responsibilities” that require us to get rest on weeknights. Full lineups have not been announced, but rest assured we’ll be there to help you get acquainted with it once they do. As usual, the announcement is tied in with the reveal of the year’s visual theme, which this year appears to be a colorful Yellow Submarine homage. (Does this mean Sir Paul McCartney will be involved? He did just put out a new record…) Check out the full banner below, along with the band’s official notification. The BossToneS’s last record, While We’re At It, was released earlier this year. The BossToneS were last seen at their own Cranking & Skanking Fest in Worcester last August, and were last heard having the right opinion regarding Nazis. UPDATE 10/17/18: Tickets are now on sale. All shows are all ages and tickets start at $27. Tickets for HomeTown ThrowDown 21 go on sale this Friday, October 5! Sunday, December 30 is an afternoon matinee!